God keeps a book on everybody. Everything that every person does is also recorded in this book. these books will be opened and we will all be judged by what was written about us in these books. against me I will blot out of my book. blotted out of the book of life and not be listed with the righteous. Here it is called the Book of Life in which everyone's name is entered. recorded before he even lived it. people, everyone whose name is found written in the book, will be delivered. peoples names are written, however, these will be delivered, not blotted out. were written down in heaven. ...along with Clement and the rest of my fellow workers, whose names are in the book of life. 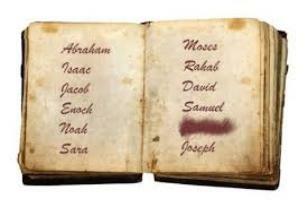 When we believe in Jesus and are born again, our names get written down in the book of life. of life belonging to the Lamb that was slain from the creation of the world. on this earth. Those who's name are not in the book will worship a false god. have been blotted out because they are still following the beast instead of God. gave up the dead that were in them, and each person was judged according to what he had done. This is a sad day, it's the day of Judgement. Books were opened, and so was the book of life. the only ones thrown into the lake of fire are those who's names are not written in the book of life. having every chance to turn to him. only those whose names are written in the Lamb's book of life. Saviour. You can find out more on how to do that by reading the Born Again - Saved study.